The ordered calm of Gloucester Abbey is shattered by the disappearance of one of the resident monks. Two novices, Elaf and Kenelm, show little concern for the missing Brother Nicholas. Rebelling against monastic discipline, they indulge in secret midnight adventures. Fearing discovery during their latest exploit, they hide in the Bell Tower, certain that they won't be found. Elaf, stumbling in the dark, trips over something and realizes, to his horror, that it is a dead body. Brother Nicholas has been found, his throat slit from ear to ear. The Abbey becomes paralyzed with fear. The Abbot is ill-equipped to deal with such a heinous crime and is still reeling from his conversation with the sheriff, who is convinced that one of the other brothers must be a killer. After all, who else would have access to the Abbey Church? Domesday commissioners Ralph Delchard and Gervase Bret arrive, sent to resolve a land dispute. The vicious murder takes immediate priority, however, and they doubt the local sheriff's ability to solve the baffling case. Before long, Ralph and Gervase realize that the killing is just a symptom of a sinister presence that threatens the whole community and must be stopped at any cost. 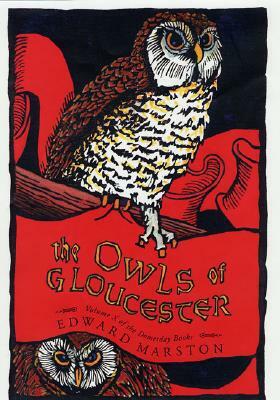 Inspired by real entries in the historic Domesday Book, The Owls of Gloucester is the tenth mystery in Edward Marston's spellbinding and richly drawn eleventh-century crime series.